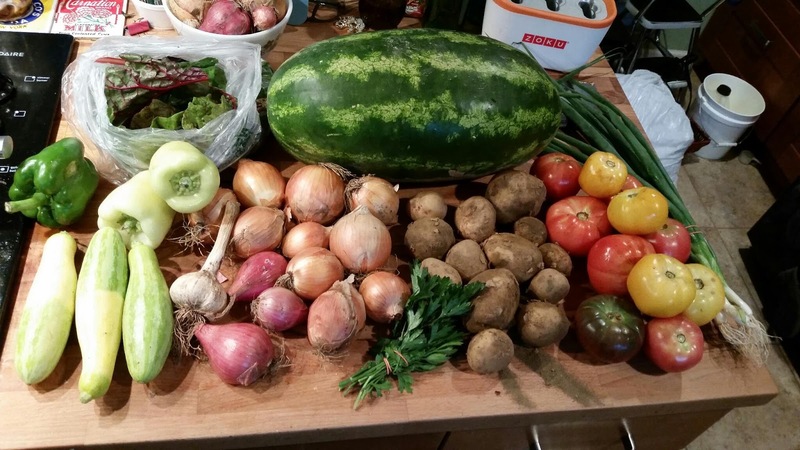 Garlic, Onions, Potatoes, Parsley, Chard, Heirloom Tomatoes, Scallions, Shallots, Slicing Tomatoes, Summer Squash, Peppers, and a large Watermelon. If I ignore the newly acknowledged bee keeper, the mismanagement of the Pick Your Own program and the inequality of the produce being given to on-farm pickup and boxed share people, then I will say I am really starting to feel like this CSA was a good idea. In the beginning, all the greens were overwhelming. But I understood, what's in season is in season. We got through those greens, between salads and smoothies, and stir-fries. It's just been extra nice to start getting the "good" stuff, the tomatoes, melons and squash. I've even loved the onions, shallots, garlic and potatoes. While inexpensive to buy, usually what you find in the store is old produce. The fresh stuff is a whole different world. That watermelon was so sweet. You know how to pick a good melon? There should be a yellow patch on the bottom from where it naturally ripened in the sun, and it should feel heavy for its size. Picking up fresh and fine vegetables from the market can be hard for the first few times, but after a while you become an expert in it. This is guide is very helpful. Thank you for sharing.